A historical experience, as there had never been one of its kind in the western world before. 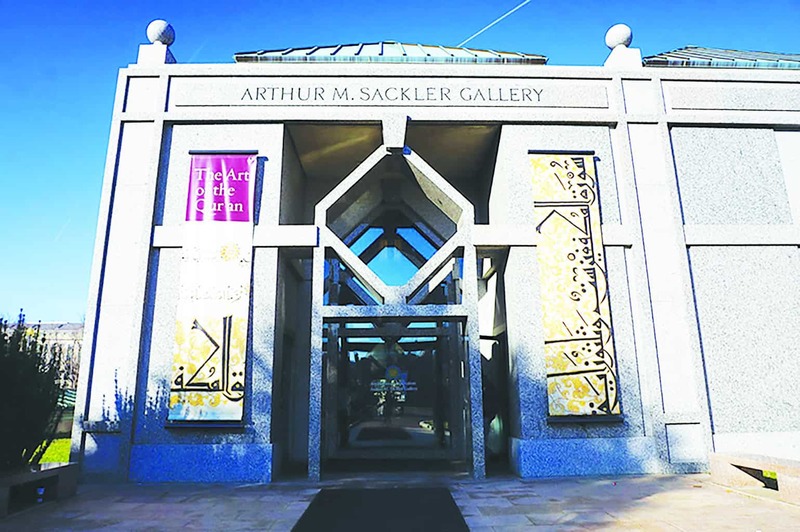 A group from the Virginia branch of American Muslim Ladies Club (AMLC), consisting of four adults and 13 young ladies, visited the Smithsonian Sackler Art Museum, where 51 items were on loan from the prestigious Topkapi Museum in Istanbul, Turkey. Words cannot express the extreme pleasure and thankfulness felt as we entered the darkened room with Surah Fatihah, the opening chapter of the Holy Qur’an, scrolling across the wall! It was the first major exhibition of Qur’ans (Korans) in the U.S. “The Art of the Qur’an: Treasures from the Museum of Turkish and Islamic Arts” at the Smithsonian’s Arthur M. Sackler Gallery in Washington, D.C., was on view from Saturday, Oct. 22. through Monday, Feb. 20, 2017. The museum also hosted ‘Imagine Asia’ and programs for all ages, including curator tours, family-friendly, hands-on art activities, storytelling performances and live demonstrations of calligraphy and illumination. The landmark exhibition, organized by the Sackler and the Smithsonian’s Freer Gallery of Art, in collaboration with the Museum of Turkish and Islamic Arts in Istanbul, featured more than 60 Qur’ans. Among the most important ever produced from the Arab world – Turkey, Iran and Afghanistan – the exhibit included works from the permanent collection of the Freer and Sackler galleries, plus a number of long-term loans. Celebrated for their superb calligraphy and lavish illumination, the manuscripts span almost 1,000 years of history—from eighth-century Damascus, Syria, to 17th-century Istanbul. The AMLC members traveled for over 3 hours to see and experience this wonderful exhibit. It was also a historical experience, as there had never been one of its kind in the western world before. As explained during the guided tour led in part by Chief Curator Massumeh Farhad and Curator Nancy Micklewright, this was the only exhibit of Holy Qurans ever hosted in America. And never had a museum like the Topkapi museum loaned out their precious treasures. Our tour guides explained that one of the instructions given by the Topkapi owners was that the Holy Qurans were to be displayed open to whatever page it fell open upon. Some who understood the wisdom behind this order, nodded our heads in agreement and marvelled at the lines the open pages revealed. Many of the Holy Qurans on display were quite elaborately copied by expert and well-known calligraphists such as the 13th century calligraphist and illuminist Yaqut al Musta’ami, who locked himself in a tower, during the sacking of Baghdad by foreign invaders, to continue his work, and legend has it, completed 1,000 copies of the Holy Quran. Yet, only 13 or 14 are known to exist today. The exhibit also displayed elaborate examples of the tools, paper, and types of ink that were used during the different time periods. We learned the many ingenious ways that copies of Holy Quran were preserved. As the tour guides explained, Muslims hold the Holy Quran so sacred that it cannot be destroyed or discarded, even after it has become unusable. One display showed a Quran whose inside covers were lined with the older pages of another Holy Quran. Some were made into boxes that could hold other items. Altogether, it was a beautiful experience and AMLC members will be looking for other such exhibits to appear in the future. We express much gratitude to the staff of the Freer and Sackler Art Institute and the Museum of Turkish and Islamic Arts in Istanbul for bringing to Washington, DC such a beautiful display of the Muslim Holy Book of Divine guidance, sobering instruction, peace and glad tidings to billions worldwide – a welcome contrast to the controversy and negativity which has lately gained a foothold there.